Besides buying a home and saving for retirement, your car buying decision is one of the bigger financial decisions you will make. Buy the wrong car and you could get buried in high monthly payments and expensive insurance. Or at the other end of the spectrum, you might cheap out too much and end up with an unreliable car that wastes your money on repairs and maintenance. Either way it could be a decision that you really end up regretting. The problem is, how do you figure out how much you can truly afford to finance? Do you simply estimate how much money you can spare each month and multiple that by the number of months you would like to finance for? Unfortunately doing that would be ignoring one part of the equation – the interest charged by the financing company or bank. Unless you are lucky enough to score 0% financing, it is something you have to take into consideration. To help with this calculation, I recommend you take advantage of a car finance calculator such as the one from The Car People. With such a calculator you can actually figure out what price of car you can afford based on your estimated monthly payment, length of financing and interest charged. When you do these calculations beforehand you know ahead of time what kind of vehicle is truly within your price range. You won’t be suddenly overwhelmed when you fall in love with a car and later find out that the monthly payments will stretch your finances too far. You just know the car salesman and finance department will put the pressure on for you to go for it anyway. The thing that you have to remember is that you shouldn’t just go for the most expensive vehicle that you think you can afford. I know I personally made that mistake. With an asset that quickly depreciates, you should instead be thinking about the cheapest car you would be satisfied with and try to buy used. The money saved would be much better put towards investing or a mortgage down-payment. Of course I know some of you do prefer to buy your cars with cash, but that simply isn’t always an option for people. There are often times when you just suddenly need to replace your vehicle. Or some people may decide that they can get low enough financing rates that their money would be best used elsewhere. Good points. I always make it a practice to have it figured out before I even start looking at cars to make sure I have the right expectations. A key is to also never tell this number to the dealer because they will then of course want to steer you towards that price of a car. Excellent point about not telling the salesman your planned purchase price. Not only will they push you to a more expensive car, but it will also hurt you in the negotiations. For sure and then they end up paying off the car for 5-7 years. If they had instead considered the overall price they could’ve paid it off in half the time and gotten something more reasonable priced. I think using a calculator and factoring in every expense possible is the best way to make a smart financial decision. We’ve done our best to pay cash for cars and if we don’t have enough to buy a car with cash then we opt to pay for the (sometimes) expensive car repair on our current vehicle. Last year we spent around $3500 on car repairs and that bought us a few more years with each vehicle; while that may sound like a lot it was absolutely cheaper than 2 car payments. Yeah $3500 does sound like a lot for repairs, but I guess it’s worth it if you extend the life enough. If I had to pay that much on an inexpensive car I’d probably end up just moving on. Then again that’s mostly because I don’t know enough about cars to deal with other problems that are next to come. I wish there had been a calculator available for my wife in 2008 when my wife bought her truck. Dealer completely lied about what the payments would be. The number she was told was at the to end of what she could afford, but when age fit the first bill, it was DOUBLE that amount. Every major financial decision if or marriage has been affected by that lie. That’s pretty brutal that they would outright lie like that. I guess there’s a reason car salesman are known as being sleazy. I wish I could blame the dealer for my stupid car buying decision. I’d be in a lot better financial shape if I had thought the decision through more. I’ve used Dinky Town Financial Calculators. It works! I’ve used the online site for calculating future values. I’m not familiar with that site, but I’m sure there are lots of similar calculators out there. The key is that you take the time to figure out what kind of payments you’d be looking at. 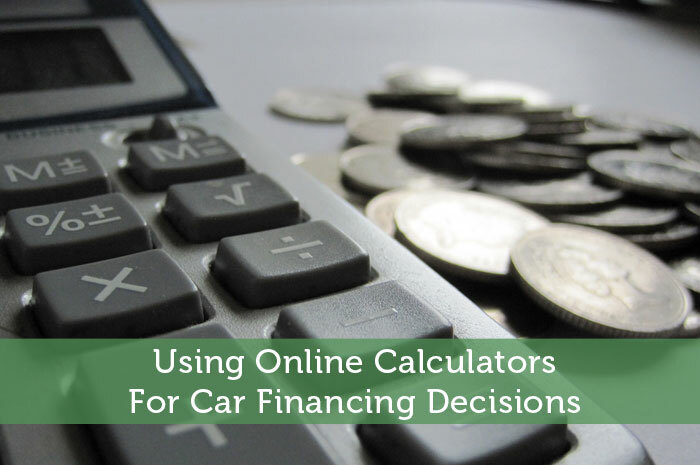 When we bought a car a month ago I used a online calculator and it helped me figure out that it was better for me just to invest my cash and finance the car at a low rate. I’ve always thought that was the smart move which is why I am surprised to hear about all of the finance bloggers who buy all their cars with cash. Great advice! Too often I’ve seen a buyer go for the max they could afford. Similar situations with houses. They forget to take into equation the maintenance cost of the car. A 3 or 5 series beamer is an automatic few thousand per year. Now if only there was a calculator that could also take maintenance costs into account for different models of cars. You always want to leave yourself some amount of breathing room when financing a car or taking on a mortgage. You can’t always predict what other expenses will pop up. It’s probably a good idea for anyone to have someone else with them when they go look at cars. It’s always good to get someone else’s advice and have someone looking at things from a more objective angle. Car salesmen definitely have a lot of experience with sweet talking people into making rash decisions. Sounds like a good plan to me, provided that you’re not always spending up to the maximum that your bank or credit union approves you for. Depending on what price the dealer is pushing I might not straight out admit the maximum I was approved for. Maybe I’d save that in case he can’t budge that low. If not, the dealer knows he can get every dollar of that pre-approval. I think as long as the cars is 3 or 4 years old you should be getting a pretty good deal. It’s during that first year that the most depreciation occurs. Of course you also have to consider how that car was driven and maintained during that time. You would think most people would utilize the great advice you give in this post, but surprisingly, many don’t. And that’s exactly what the car dealers are hoping. They know this is as much an emotional purchase, as it should be a tactical purchase. And the less prepared you are for it, the greater the level of buyers remorse you’ll have after the fact! You’re absolutely right that it is an emotional purchase. Since we are always bombarded by car ads and see nicer cars driving on the road everyday, there is a large amount of pressure on people to get keep up with the Joneses with their car purchase. When I wasted a ton of money on my car, the last thing I was thinking of was how good an investment it would be. In my eyes it was just too cool a car to pass up and that the enjoyment it would give me would be well worthwhile. Thinking back I know I could’ve got a lot more enjoyment out of that money by spending it more wisely. They do make things pretty easy. Also they’re a great viral marketing strategy for online companies. I programmed an automotive related calculator for of my employers and it is still one of their most popular pages. I think many people get stuck on a particular model or option that they want and pay more than they should. Unless you live in your car, I would get by as cheap as possible. That being said, I do feel heated seats are pretty sweet, and I’d be sad if I had to give those up. That is true. Before people even look into financing and final price they often have a specific model in mind. I know that was the case when I bought my car. In the end it cost a lot more than I expected. Since I was so set on it and they were willing to loan me that much money I stubbornly went for it. I’ve always paid cash, and usually buy used cars from private individuals. I also tried to focus on buying cars that are known to be long lasting, like Toyota and Honda. Unfortunately very few people have that mindset when buying a car. Too many people insist on buying new and they are likely to be looking to get the most expensive car they can get financing for. I’ll be honest, when BF was going to buy a new car, he just tried to look for the cheapest, smallest car from a decent auto company (so not American) and his little Hyundai has done well these past few years. I guess he has more willpower than I did when I bought my car. I do wonder how satisfied I’d be with a cheap car if I suddenly had to get a new car today. After having my current car for a while I might’ve spoiled myself into feeling that I need a nicer car. This is the smart way to go about things.. It seems that far too many folks fall into the “how much of a monthly payment can you afford” trap that many car dealerships attempt to pull.. Do your homework ahead of time! Yes in our highly competitive world people too often strive to get the very best they can afford, whether it be cars, houses, clothes, vacations, etc. They figure that as long as they can scrape the cash together, it fits into their budget. They seem to forget how they could instead use that money more productively by settling for less. I love online calculators….mortgage calculators, amortization calculators, retirement calculators. They all help to plan ahead! It sure beats trying to figure out all of those calculations on your own. A lot of the time it is just too complex unless your a MS Excel wiz. Some of those extras can be pretty tempting though and the salesmen know just how to pitch those things. When I bought my car I was unfortunately fairly set on certain upgrades that were nothing more than cosmetic.